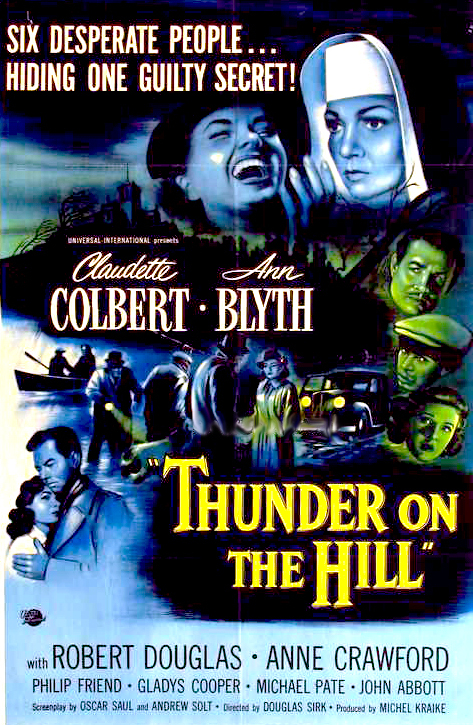 THUNDER ON THE HILL, a mystery directed by Douglas Sirk, is a polished and very engrossing film which I thoroughly enjoyed. The film is a great example of Golden Era Hollywood at its best; it may not be a top-level classic, but it was made by highly talented professionals in front of and behind the camera, and the result is a very satisfying 84 minutes. 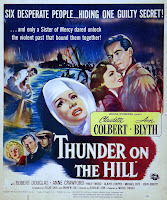 THUNDER ON THE HILL is based on a play by Charlotte Hastings, and while the movie's roots on the stage occasionally show through, the film's outstanding set design and the excellent, intense performances by a large cast help free it from feeling too stagebound. It's a substantive, nicely detailed story with a lot going on in a fairly short running time. A flood in a small English village drives the local residents up the hill to the safety of a massive convent and hospital. 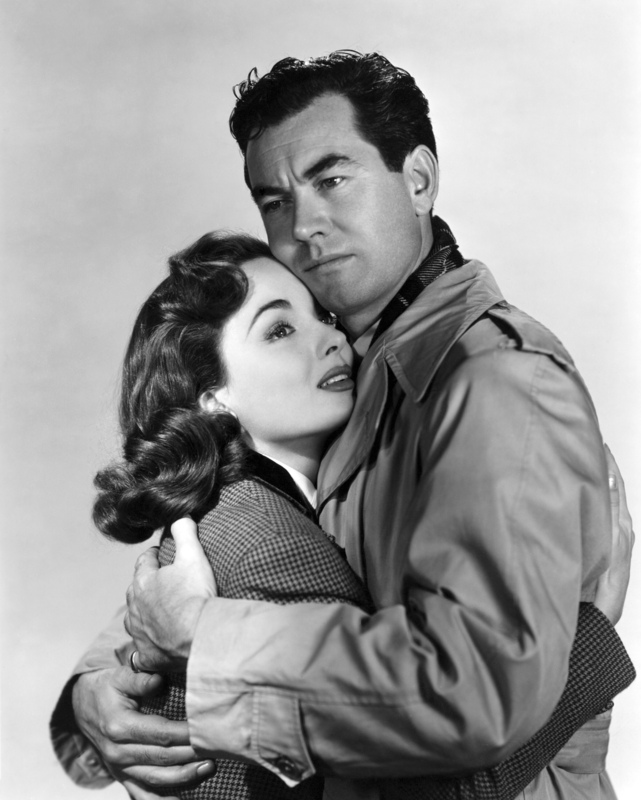 The storm and flood also strands Valerie (Ann Blyth), a young woman being escorted to the gallows for her brother's murder. Sister Mary (Claudette Colbert) is quickly convinced that Valerie is innocent. 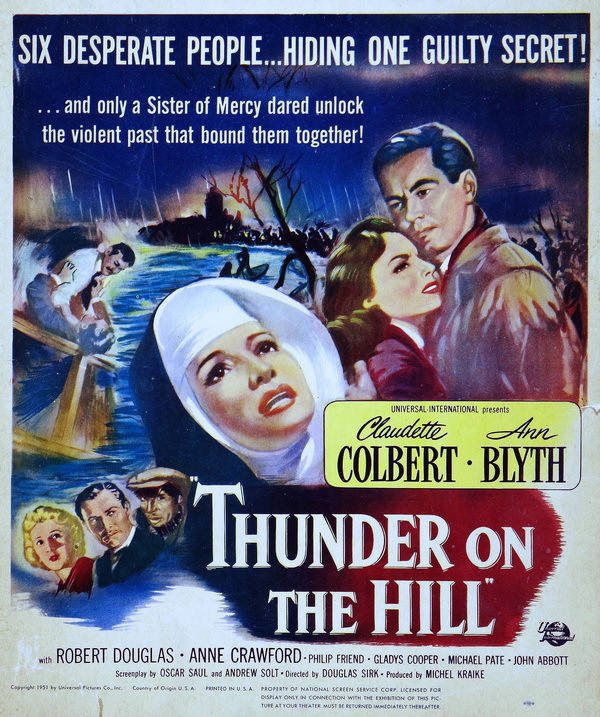 With the help of dim-witted handyman Willie (Michael Pate), she finds a way to honor Valerie's request to bring her fiance (Philip Friend) to the convent to say farewell; meanwhile, Sister Josephine (Connie Gilchrist), the cook, helps Sister Mary research the case in back issues of newspapers. 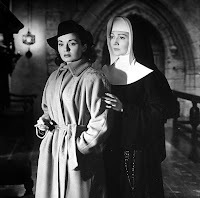 With everyone from the local area trapped at the convent during the storm, all of the key players are in place as Sister Mary gradually unravels the mystery, despite the concern of her Mother Superior (Gladys Cooper) over some of Sister Mary's actions. This film is high on the list of films I've enjoyed the most this year. I'm a big fan of both Colbert and Blyth, but I also really liked the well-constructed story and the very interesting setting. It's a film where I would have loved to have walked through the convent's winding halls myself and examined each room in person! Colbert and Blyth are outstanding. Colbert, playing a perfectionist who struggles with guilt over her sister's suicide, is forced at times to question her own motivations and whether she has done the right thing in giving hope to a young woman facing imminent death. I continue to be very impressed with the diversity of Blyth's performances. She manages to go far beyond the script in creating characters with very different personalities, speech patterns, and body language. Having seen her in a few films this year, including ONCE MORE, MY DARLING (1949), ONE MINUTE TO ZERO (1952), and KISMET (1955), I appreciate her abilities all the more. It's rather impressive that the ultra-animated, effervescent "Killer" of ONCE MORE, MY DARLING, the gorgeous young Marsinah singing in KISMET, and the bitter murder convict of THUNDER ON THE HILL are all the same actress. The performances are good across the board, but I particularly enjoyed Connie Gilchrist, a reliable character actress who so often played housekeepers and cooks. She's a cook again in this, but she has a chance to shine here in an unusually large role, and she makes the most of it. As a side note, this being Hollywood England, the characters' accents are all over the map. Like Robert Taylor in the recently watched PERSONAL PROPERTY (1937), Colbert and Blyth don't attempt British accents, while Gilchrist uses a brogue effectively. Most of the cast is comprised of British actors, including Cooper, Friend, Robert Douglas, Anne Crawford, John Abbott, Queenie Leonard, and Norma Varden. The movie was beautifully photographed by William Daniels. 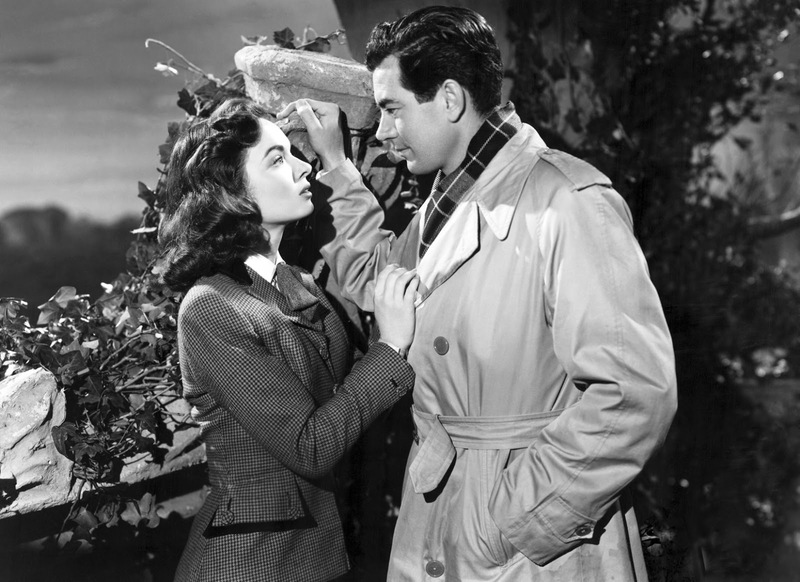 This Universal film is available in a lovely print from the TCM Vault Collection. It's out as a single title or as part of the four-film Douglas Sirk Filmmaker Collection. Extras include an introduction by Robert Osborne and a very nice collection of stills, publicity photos, lobby cards, and posters. Recommended as very enjoyable entertainment. I agree with you this is a good thriller and deserves more attention. It's full of atmosphere and Claudette Colbert and Ann Blyth are well cast. This sounds splendid, and I regret I've never heard of it. Must be on the lookout. I'm glad you liked this one too, Vienna! Jacqueline, I suspect you would really enjoy it. :) Hope you can track it down one of these days! Wonderful review Laura! I must watch this film! I'm sad that TCM is not showing it on Blyth's Summer Under the Stars day but I just added it to my Classicflix queue so I can watch it. I actually asked for the Blyth day off from work so I can watch some of her films. How exciting you will have a day off to enjoy Blyth's movies, that sounds like so much fun! Really hope you will like THUNDER ON THE HILL. As you can tell I really enjoyed watching it. 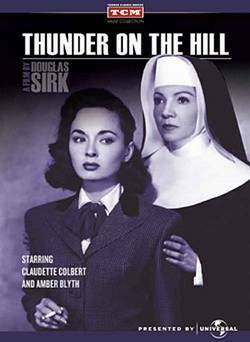 It occurs to me THUNDER ON THE HILL might make a nice double bill with another mystery set in a British hospital, GREEN FOR DANGER.